Sarah and I are convinced we were born with a shuttle in our hands! 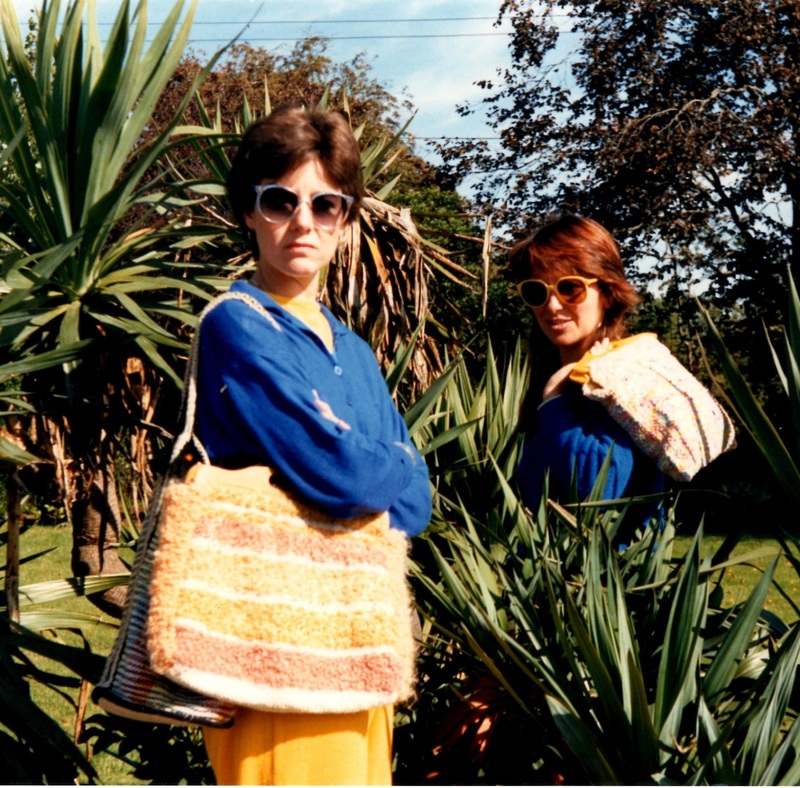 We met in 1984 at a spinning class and discovered that we had both been weaving on a Weavemaster table loom for many years and were passionate about weaving exciting fabrics to make unique and interesting clothing. Our shared interest led to our first book, Simply Woven, self published in 1986 and then our second book, Creative Weaving, published by Gaia in 2007 which explores woven textures on the rigid heddle loom. Our love for rigid heddle looms is not misplaced as they are so versatile, easy to use and very portable. All the major weaving companies are now making rigid heddle looms so do look out for them as they can get you up and weaving in a matter of hours. We weave everyday and could not live without the pleasure of the yarns, colours and textures. 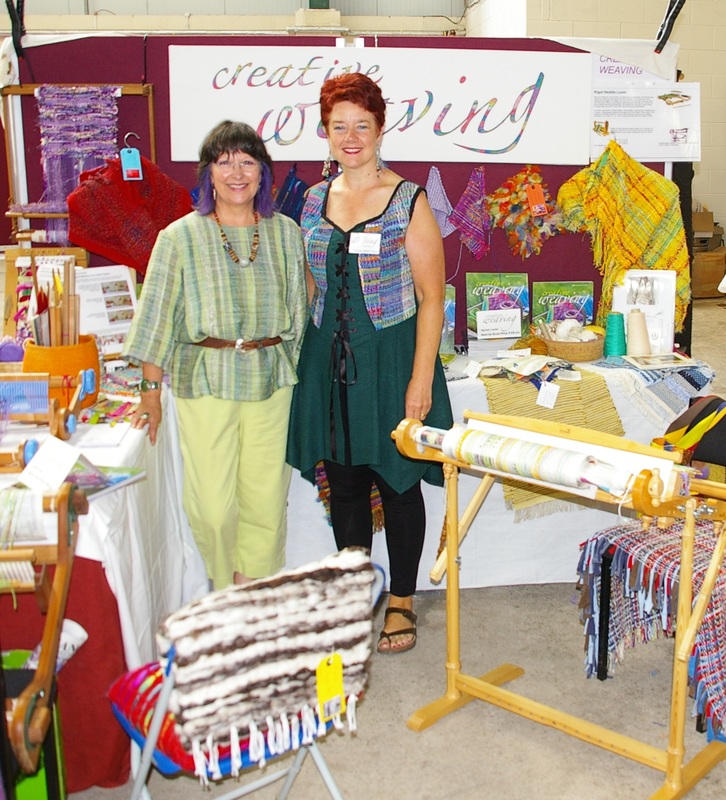 We hope to inspire everyone to enjoy our love of weaving. Glad I found your blog!! I lov my rigid hedde loom and hav been looking for inspiration beyond scarves! Your book amazing, btw. I bought it a few years ago and refer to it often. Thank you for your comment. Yours was our first one as we are very new to this blogging thing so a special thank you. So glad you liked the book and hope it continues to inspire. Hi just found your site, your friend from essex! Just taken new weaving off loom yesterday, really excited about making it into garment from your first book, its all red and green and some jam jar dyeing, all homespun from my own sheep. Hi Sue, Thanks for looking us up. Your weaving sounds great and jam jar dyeing too, I think that would make a good blog page. Sarah and I are off to Fibre East tomorrow to stock up on more lovely woolly things as if Woolfest had not been exciting enough. Hope to see you on August 11th at Ashman’s Farm. Hi Elisabeth, just met you at the National Exhibition of the Guild at Norwich Cathedral. You had a ‘go’ on my 28″ Knitters Loom. I just wanted to say a big thank you for the advice you gave me. As a new weaver it is fantastic to have advice from someone with such great experience. I loved your jacket and can’t wait to see it in the new book! I have today ordered your Creative Weaving book, I would have loved to have also had a copy of Simply Woven but I guess it is out of print as, sadly, I can’t find it anywhere on the internet. Great to have your new book GET WEAVING, you must be so pleased with it, the printing is really good, and the colours have come out well, (I used to work in printing, years ago) I love the photos and all the contents,I must not go on, its full of great ideas and clear instructions, you are both so good at what you do with weaving, giving us beginners such inspiration, best wishes Sue from essex. Hello, very inspired by your blog. I’m a knitter and sewer and I’m interested in producing fabrics to create garments with, but using a loom that is portable and straightforward. What would you recommend for a beginner wit some stash to bust? Would a 12″ be too limiting in terms of fabric produced? And would an integral warping board be an advantage? Thanks! So glad you like the Blog. We always recommend the Ashford 20″ (50cm) Knitters loom for the following reasons. It folds with the warp on the loom. This can be really useful if you travel a lot or have limited space at home. It is the perfect width for making clothing. Any wider and you waste your handwoven fabric when the pattern goes on. Any narrower and you are rather limited to the garments you can make although it does work well and you just have to weave a longer length. The loom comes with a 7.5dpi (30/10cm) reed which is perfect for all sorts of yarns and great with handspun. You don’t need a warping board at all as you can follow the quick threading method instructions that will come with the loom or you can watch a demonstration on the Ashford web site. All rigid heddle looms can be threaded up this way, whatever their make or dimensions so you should able to start weaving very quickly. Hope this will help you to get started and have lots of fun with the rigid heddle loom. I’m trying to find you booklet cutting without fear etsy says it’s sold. How can I order one please ? So sorry I did not pick up on your message before now. Try again with the etsy shop or contact Sarah direct with her email address which is getweavingwithsarah@gmail.com I hope you have success. I edit the newsletter for Oxfordshire Guild of Weavers, spinners & dyers and have just discovered your blog. I was wondering if you would mind if I include your super blogroll in our next issue. The newsletter is only circulate to our members with a few copies to nearby guilds for their info. I would , of course, accredit your blog.